Our story began with one machine in a garage in 1951. We've since grown into a 70,000-square-foot manufacturing facility with state-of-the-art equipment and a team of experts with extensive capabilities. Our growth has been driven by our employees' continued efforts to exceed each customer's expectations. Engineering is key to our process and our long-lasting customer relationships. 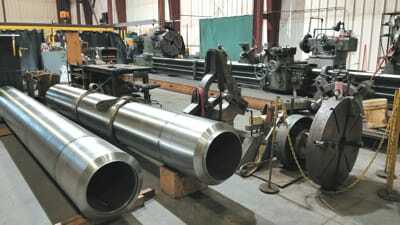 Our team of engineers responds to formal quote requests with an unwavering commitment to matching the right cylinder to the right application and industry. Our engineering department relies on decades of experience to provide the foundation of our work. Beyond quoting, our engineers and draftsmen work with you to design the best hydraulic or pneumatic cylinder for each application. They work to understand exactly what the job requires to achieve long-lasting performance—using a collaborative approach that engages our customers from the first step through project completion and beyond. We don’t make recommendations until our investigation is complete. Once complete, our engineers recommend a design. Whether it's a completely custom design or a standard cylinder from our suite of products, B&H has a cylinder that will meet all your demands. Our proprietary engineering schematics, drawings and designs are the starting points for precision cylinders that outlast and outperform. The B&H repair department can repair cylinders for many industries. For example, we repair continuous casters, hot strip mill and blast furnace cylinders for the steel industry. We also work on large bore extrusion, injection molding and press cylinders and hydraulic cylinder repair, to name just a few. We also repair, rebuild and refurbish cylinders to meet OEM specifications and for all cylinder manufacturers. During our initial discussions, we'll examine your cylinder to identify deficiencies that, if corrected, could increase the cylinder’s service life significantly. We're equipped to diagnose and fix deficiencies that lead to better performance, precision and quality. A cornerstone of who we are, our quality department stands for everything we do, every design we create, every cylinder we manufacture and every piece we repair. Our quality process includes extensive product testing to ensure total precision and ongoing performance. We apply the highest levels of quality assurance to all of our cylinders and services. We follow dedicated quality control standards for the manufacture and testing of every cylinder. We also test functionality and conduct pressure tests and total testing on all finished products. All of our departments work together for seamless customer experiences and solutions. For more than 50 years, we have designed, repaired, rebuilt and refurbished heavy-duty cylinders for quality results and precision performance. Our experts know design, repair and quality. We’d like to know you.